Flyers goaltender Brian Elliott, shown in last season's playoffs against Pittsburgh, will make his preseason debut Wednesday in New York. 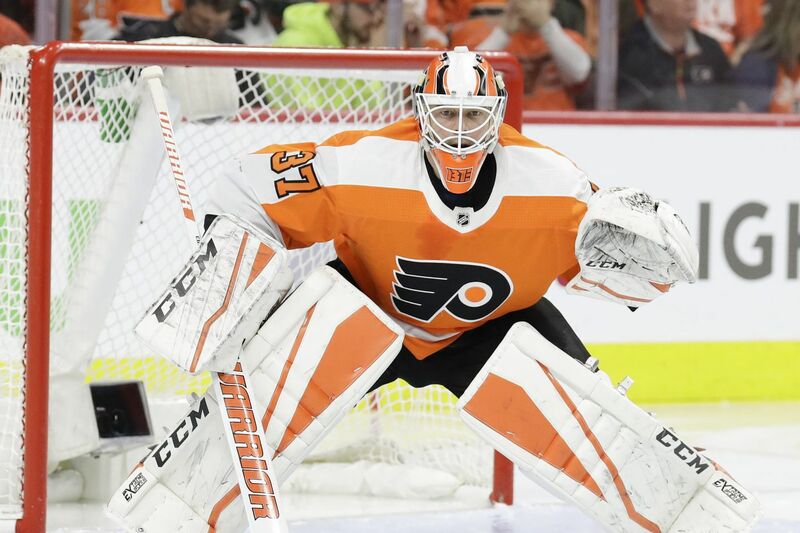 Flyers goalie Brian Elliott will make his preseason debut Wednesday in a 7 p.m. matchup against the New York Rangers at Madison Square Garden (97.5 The Fanatic). Elliott, who had abdominal surgery in February and was ineffective after returning to the lineup late in the season, is expected to be ready to handle the No. 1 duties this year. Carter Hart, the 20-year-old who dominated the Western Hockey League and is viewed as the Flyers' goalie of the future, also will play. He stopped all 11 shots he faced in his preseason debut, a 3-1 win Monday over the Islanders. Henrik Lundqvist and Dustin Tokarski will be the Rangers' goalies. Tokarski played last season for the AHL's Phantoms. Will left winger Carsen Twarynski, who is a long shot to make the team, continue his impressive play and push for a roster spot? Twarynski will be on a line with Jordan Weal and Nic Aube-Kubel. Can 6-foot-3, 160-pound defenseman Yegor Zamula, a camp invitee, play well enough to earn a contract? If the Flyers don't sign him, he will likely be selected in the 2019 draft. Zamula will be paired with Christian Folin on Wednesday. Keep an eye on the play of Weal, impressive rookie Mikhail Vorobyev, and Scott Laughton, three players who could end up as the third-line center. Laughton will be at right wing tonight. Vorobyev will center Claude Giroux and Dale Weiss. Defenseman Phil Myers, battling for a roster spot, will be paired with Robert Hagg.